A bit about our Team and what we do? The team understands the goals and is committed to attaining them. This clear direction and agreement on mission and purpose is essential for effective team work. This team clarity is reinforced when the organization has clear expectations for the team's work, goals, accountability, and outcomes. The team creates an environment in which people are comfortable taking reasonable risks in communicating, advocating positions, and taking action. Team members trust each other. Team members are not punished for disagreeing. Communication is open, honest, and respectful. People feel free to express their thoughts, opinions, and potential solutions to problems. People feel as if they are heard out and listened to by team members who are attempting to understand. Team members ask questions for clarity and spend their thought time listening deeply rather than forming rebuttals while their coworker is speaking. Team members have a strong sense of belonging to the group. They experience a deep commitment to the group’s decisions and actions. This sense of belonging is enhanced and reinforced when the team spends the time to develop team norms or relationship guidelines together. Team members are viewed as unique people with irreplaceable experiences, points of view, knowledge, and opinions to contribute. After all, the purpose for forming a team is to take advantage of the differences. Otherwise, why would any organization approach projects, products, or goals with a team. In fact, the more that a team can bring out divergent points of view, that are thoughtfully presented and supported with facts as well as opinions, the better. 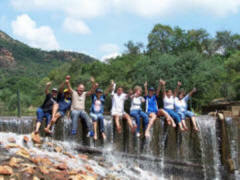 We deliver corporate team building Events and days across South Africa at virtually any Conference Venue or Lodge. We do the traveling so you don't have to. This saves you time and helps you stay in budget. Our philosophy - We at SA TEAMBUILDING are interested in your success for the long term. We know the best way to increase our business, is to prove we can help increase your business. That's why our training and Fun Team Building days are guaranteed to deliver a 150% return on investment. Hiring us actually adds to your profit. Our desire is to earn your trust and be the company you think of first when you need to outsource training and Team Building. SA TEAMBUILDING's mission is to promote and advance employee productivity and the benefits that flow from this vital and necessary component of Teambuilding. SA TEAMBUILDING Team belief is this constantly searching and improving productivity is not just the domain of senior management, nor the domain of for profit companies, large and small, but all organizations who pool human resources, towards a given goal. We strive to provide your team with an experience they will enjoy and motivate them to become more productive in your organization.